SWGoH: Should I Buy the Rogue One (Movie Premier) Pack? The latest item available in the Star Wars Galaxy of Heroes Data Cards is the new Rogue One Pack, made available during the weekend of the premier of Rogue One. 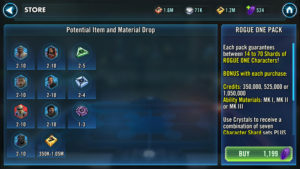 For just 1,199 crystals, you can own… more shards of Bistan and Scarif Rebel Pathfinder and not much else. This pack is being marketed in a misleading manner, I believe myself and others have been mis-sold. The pack description depicts all of the characters equally, this is the Bistan and SRP pack. I bought 10 packs and this is what I got. This pack gave bistan and SRp 90%. Feel this is a huge rip off. Just brought 10 my self and similar results. All of this is in line with my meager attempt – one pack purchased – where I received 2 shards of Chirrut Imwe and everything else was Bistan or the Scarif Rebel Pathfinder. Those guys are nice to have characters, but not worth spending 1,199 crystals on in my options. Read more on the SWGOH forums if you like. Be the first to comment on "SWGoH: Should I Buy the Rogue One (Movie Premier) Pack?"